Originally published 9 August 2017. With President Trump’s latest comments that North Korea is facing a response of ‘fire and fury’ if it endangers the US, it’s clear that the US president is at least thinking about a pre-emptive strike of some kind. No doubt there are cells hard at work in the Pentagon drawing up plans and evaluating the likely efficacy of such actions. Some are arguing that the presence of wiser heads in the administration, particularly those with high-level military backgrounds, will help to prevent catastrophic miscalculations. I’m not sure about that. History suggests that the advice the president gets will vary in both quality and tone, from either civilian or military (serving or retired) sources. I teach a course at the ANU on the use and misuse of intelligence in managing national security matters. One of the case studies I draw on is the Cuban missile crisis of 1962. Because there’s a rich trove of primary source documents available from the US and Soviet sides, a fairly accurate and detailed deconstruction of events is possible. You can find many of the relevant documents and some excellent essays at the George Washington University National Security Archive site. 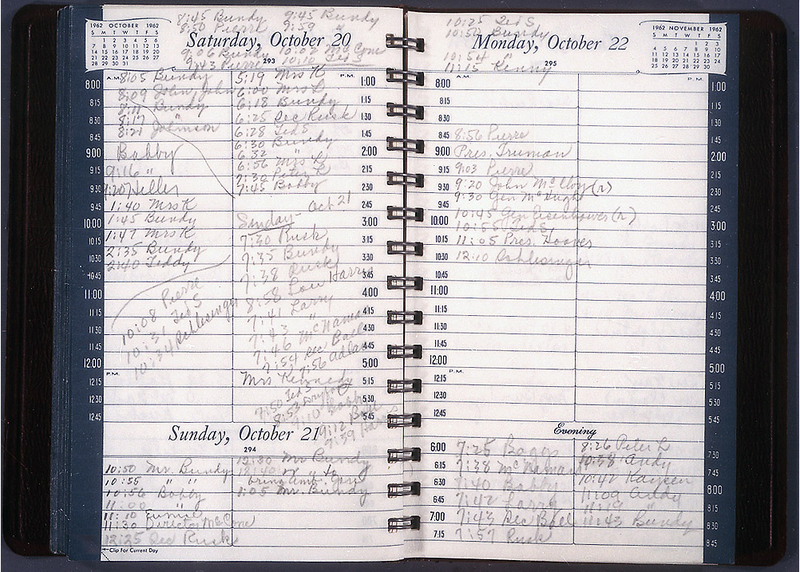 For this post, I want to focus on a meeting that President Kennedy had on a prodigiously busy Sunday 21 October 1962. Defense Secretary Robert McNamara’s notes of the meeting (transcribed here) show that Kennedy and McNamara met with Kennedy’s military adviser, retired general Maxwell Taylor, General Walter Sweeney of Tactical Air Command and Attorney General Robert Kennedy. John A. McCone, the Director of Central Intelligence, joined the meeting 15 or 20 minutes in. McCone made his own memo afterwards (CIA document 71—note that the time is incorrectly recorded). [I]t now appears that there is equipment in Cuba for approximately 40 MRBM or IRBM launchers. The location of the sites for 36 of these launchers is known. 32 of the 36 known sites appear to have sufficient equipment on them to be included in any air strike directed against Cuba’s missile capability. We believe that 40 launchers would normally be equipped with 80 missiles. John McCone reported yesterday that a Soviet ship believed to be the vessel in which the Soviets have been sending missiles to Cuba has made a sufficient number of trips to that island within recent weeks to offload approximately 48 missiles. Therefore, we assume there are approximately that number on the Island today, although we have only located approximately 30 of these. So the CIA was unsure of the whereabouts of at least four missile launch sites (it’s not clear if each site had a launcher present, so the whereabouts of more than four launchers could also be unknown) and 18 nuclear-capable missiles. stated that he was certain the air strike would be ‘successful’; however, even under optimum conditions, it was not likely that all of the known missiles would be destroyed. General Taylor stated, ‘The best we can offer you is to destroy 90% of the known missiles.’ General Taylor, General Sweeney and the Secretary of Defense all strongly emphasized that in their opinion the initial air strike must be followed by strikes on subsequent days and that these in turn would lead inevitably to an invasion. As we saw above, 40% of the missiles suspected to be on the island remained unlocated. So General Sweeney was promising, at best, to destroy just over half of the missiles, but was urging the president to go for it—and then follow up with an invasion of the island. Luckily, wiser heads prevailed. Robert Kennedy and McCone both spoke against the proposed operation, and ‘CIA representatives, who joined the discussion at this point’, said that it was possible to launch the remaining missiles before a follow-up strike could be completed. Sweeney was effectively advocating a course of action that could directly result in a retaliatory nuclear strike against the American eastern seaboard. Not surprisingly, DCI McCone was busy around that time. He met with Kennedy again at 4.30 that afternoon and relayed a conversation he’d had with former president (and general) Eisenhower (CIA document 72). Eisenhower’s view—on the ‘basis of his experience in war in countless examples of air strikes which though most effective, were never completely conclusive’—was that a swift invasion and occupation of Cuba would have to form part of the plan to ensure that the missile sites were secured. So Kennedy’s generals gave him conflicting advice. Crucially, he got advice that decisive military action was warranted—despite the evidence that it might result in a nuclear strike on American soil. Ultimately the decision to launch a strike or not came down to his assessment of the situation, and he decided on a combination of public strength (in the form of a naval blockade) and private negotiation (effectively swapping Soviet missiles in Cuba for American ones in Turkey). We don’t know what advice President Trump is getting about the prospects for an air strike on North Korea. History suggests that we can’t be sure that it will be either consistent or cautious, and the presence of military-trained minds in the White House mightn’t be the positive that some hope. These are worrying times. Andrew Davies is senior analyst for defence capability and director of research at ASPI. Image courtesy of the JFK Library.